Delhi,22 July:The UPA govt scored an emphatic victory in the confidence vote in the Lok Sabha with a comfortable margin, ending the political uncertainty that will enable the ruling coalition to push ahead with the Indo-US civilian nuclear deal. The motion, which was forced by the Left parties’ decision to withdraw support to the Government on the deal, was adopted with sizeable cross-voting from Opposition members including at least one visibly from Telegu Desum. There was erosion in opposition numbers with only 256 opposing the motion against 275 supporting it. In a House with an effective strength of 541, the Government needed 271 and in the ultimate result it got four more than the half-way mark, belying predictions of a cliffhanger of a contest. The day was marred by high drama when BJP members shocked the House displaying bundles of currency notes. 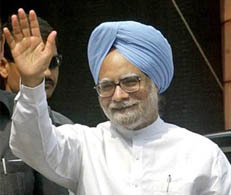 Charges and counter-charges over the bribery allegations disrupted proceedings for over two hours with the Opposition members not allowing Prime Minister Manmohan Singh to make his customary reply winding up the two-day debate that was often acrimonious. In his six-page reply, which was laid on the table, the Prime Minister hit out at the Left parties saying "they wanted me to behave as their bonded slave." "They wanted a veto over every single step of negotiations which is not acceptable," he said with regard to the negotiating processes he wanted to undertake with the International Atomic Energy Agency and the Nuclear Suppliers Group before operationalising the nuclear agreement. Singh said the nuclear agreement will end India’s nuclear isolation and apatheid and asserted that the agreements negotiated with the US, Russia, France and other countries would enable India to enter into international trade for civilian use without any interference with the nation’s strategic nuclear programme. The Prime Minister said "I have often said that I am a politician by accident……. whatever I have done in this high office I have done so with a clear conscience and the best interest of my country." M Jagannath of the TDP, who apparently defied the party whip, came to the Prime Minister soon after the vote and congratulated him. Later, he was seen seated in the Congress benches before the result was officially announced by the Speaker. It was not also clear after the corrections how many abstained and how many votes were cast in all. Leader of the Lok Sabha Pranab Mukherjee was the first to congratulate the Prime Minister followed by Congress President Sonia Gandhi who is also the UPA Chairperson. The Prime Minister hugged Rahul Gandhi who made a brief speech hailing the Prime Minister’s initiative on the nuclear deal. Singh was also profusely congratulated by almost all the Union Ministers and members of the ruling combine who crowded around him while waiting for the official declaration of the result. As Sonia Gandhi beamed in relief, Pranab Mukherjee was also the centre of attraction for the UPA MPs. CPI-M member Varkala Radhakrishnan was the lone opposition MP to move to the treasury benches to congratulate the Prime Minister. Hitting back at L K Advani for levelling charges of incompetence against him, Prime Minister Manmohan Singh asked the BJP leader to do some "introspection" over his role when Gujarat was burning and during the Kandahar hijack crisis. Replying to the debate on the trust vote in the Lok Sabha, he also asked "our friends" in the Left Front to ponder over the company they were forced to keep because of the "miscalculations" by "their general secretary", an apparent reference to CPI-M general secretary Prakash Karat. The Prime Minister tabled his speech after he started to speak amid uproarious scenes and slogan shouting by the Opposition who demanded his resignation over the bribery issue. "Before levelling charges of incompetence on others, Advani should do some introspection. Can our nation forgive a Home Minister who slept when the terrorists were knocking at the doors of our Parliament?" he asked. Singh also wanted to know whether the nation can forgive a person who "single handedly provided the inspiration for the destruction of the Babri Masjid with all the terrible consequences that followed". Accusing Advani of making "atleast three attempts to topple his government" to fulfil his ambitions, the Prime Minister said "but on each occasion his (Advani’s) astrologers have misled him". Singh noted that the BJP leader had used "abusive" adjectives to describe his performance like "weakest PM", "nikamma(incompetent) PM" and of having devalued the office of PM. In the speech which he tabled following slogan -shouting, Singh was unsparing in his criticism. "At his ripe old age, I do not expect Advani to change his thinking. "But for his sake and India’s sake, I urge him to change his astrologers so that he gets more accurate predictions of things to come", he said. "Can a nation approve the conduct of a Home Minister who was sleeping while Gujarat was burning leading to the loss of thousands of innocent lives ? asked Singh. In a no-holds barred onslaught at the beginning of his speech, the Prime Minister said Advani had to "atone for his sins" suddenly decided to visit Pakistan and there he discovered the "new virtues" in Jinnah. Singh noted that Advani’s own party and "his mentors" in the RSS disowned him on this issue.The Prime Minister also raised posers to Left parties asking whether Advani was acceptable to them as a Prime Ministerial candidate. a very shameful act by SP.GETTING VOTES IN EXCHANGE FOR MONEY IS AGAINST THE BASIC PRINCIPLES OF DEMOCRACY. avery shameful act done by SP. Congratulation . PM sir we all indian are with you. you have teach the lesson to BJP and left parties, those always try to black mail you.